Inaugural lecture: "Mathematical algorithms and software for ELT adaptive optics"
The principal of the Johannes Kepler University Univ.Prof. 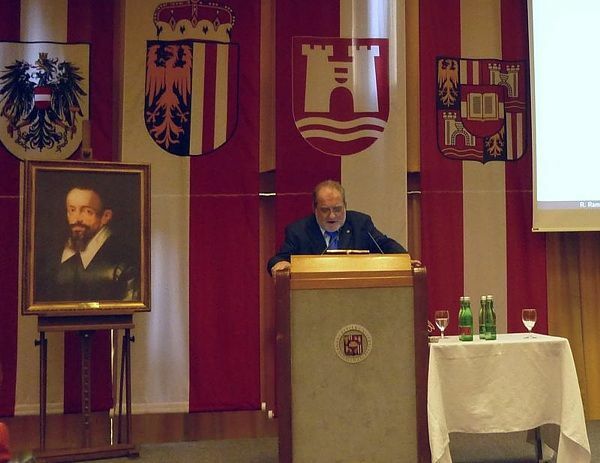 Dr. Richard Hagelauer delivered the opening speech. Univ.Prof. 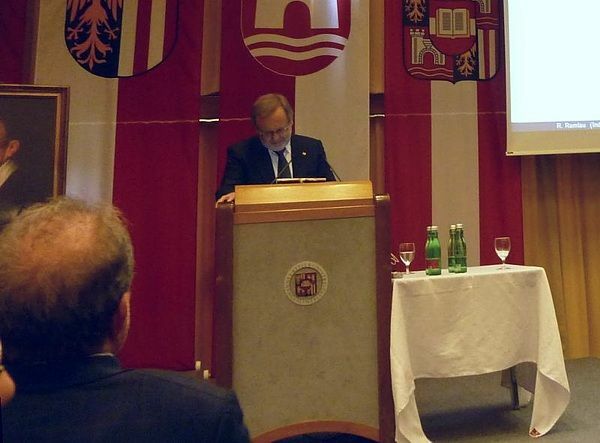 Dr. Erich Peter Klement, dean of faculty, introduced Univ.Prov.Dr. Ronny Ramlau to the audience. 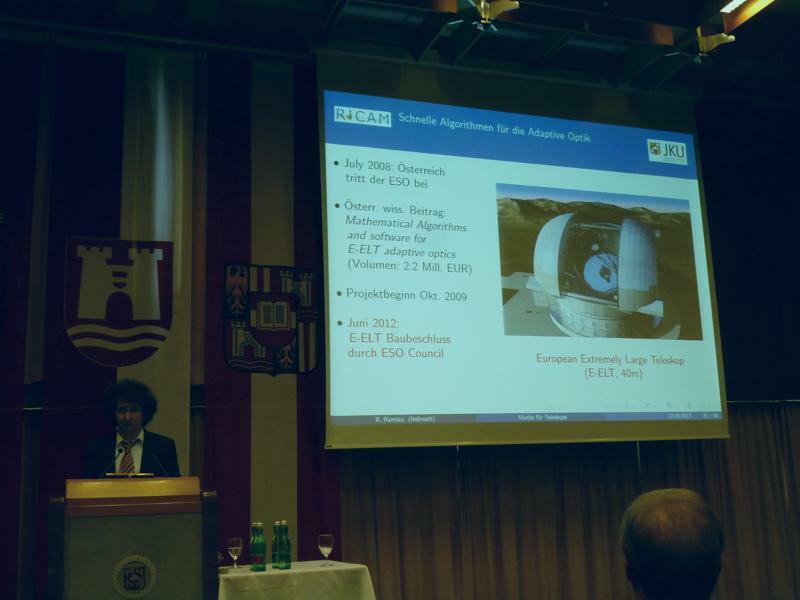 The project "Mathematical algorithms and software for ELT adaptive optics" is part of the In-Kind contributions of Austria to the European Southern Observatory (ESO). 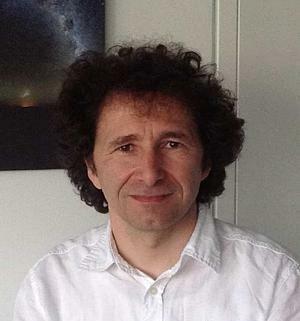 The project is carried out jointly by the Industrial Mathematics Institute of the University of Linz, the Johann Radon Institute for Computational and Applied Mathematics (RICAM) and the Industrial Mathematics Competence Center (IMCC) in Linz. 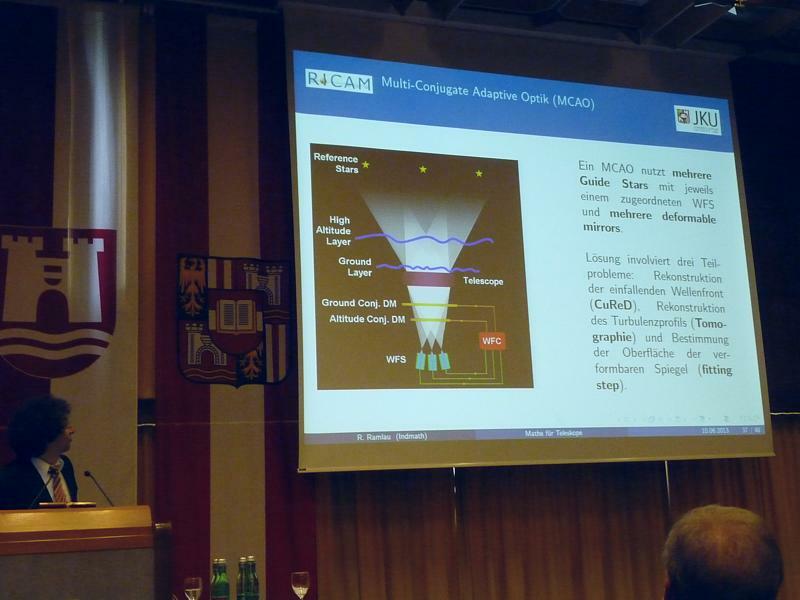 The aim of the project is the development of mathematical methods for different types of adaptive optics technology such as single-conjugate adaptive optics (SCAO), multi-conjugate adaptive optics (MCAO) and multi-object adaptive optics (MOAO). The ESO maintains one of the world's biggest telescopes utilizing adaptive optics called the Very Large Telescope (VLT) on mount Paranal in Atacama desert and is developing the European Extremely Large Telescope (E-ELT). 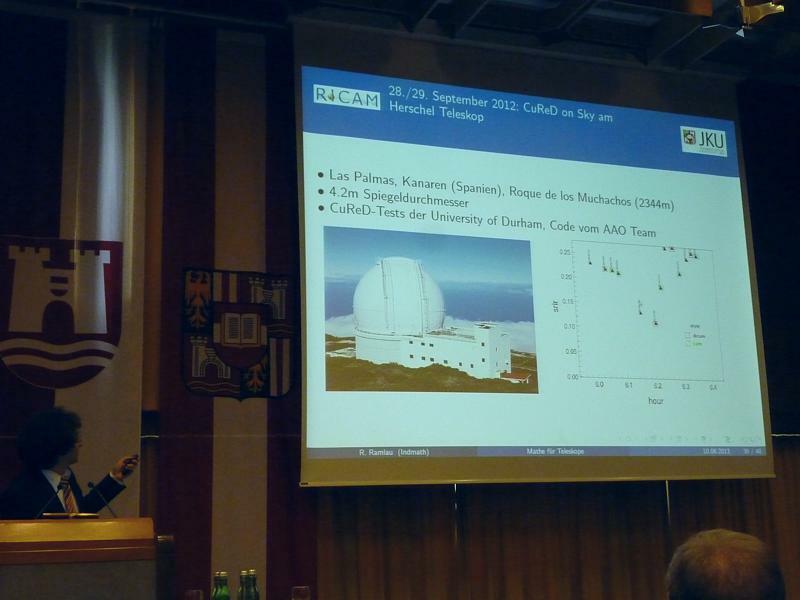 Parts of the software are already successfully tested and in use in other observatories. The fundamental limitation of classical AO methods like SCAO is the narrow field of view. To overcome this problem the concept of AO requires further development. The technique called multi-conjugate adaptive optics (MCAO) utilizes more than one deformable mirror in the process of correcting the wavefront aberrations. Each mirror is optically conjugated to an individual distance from the telescope and corrects the aberrations produced by different layers of atmosphere. The signals driving the deformable mirrors are obtained from severals WFSs, each observing its own guide stars. This information is processed to first reconstruct the 3D structure of the atmospheric turbulence profile and then estimate the actuator commands. The crucial first step of solving the 3D profile is called atmospheric tomography and the related mathematical problem is severely ill-posed. In order to overcome the negative effects of the ill-posedness, sophisticated methods from the field of inverse problems, such as regularization, have to be applied. The huge computational task involved in applying MCAO for ELTs is one of the core challenges in the project. 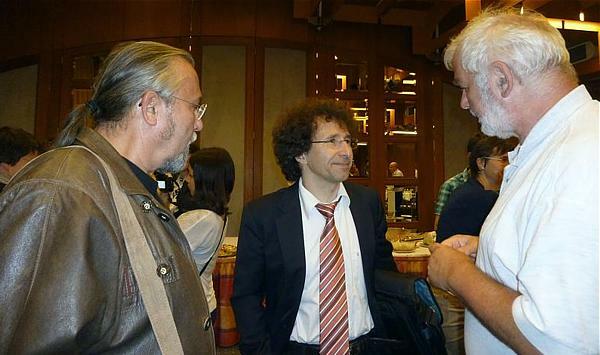 After the lecture there was a cold buffet and I had the pleasure to talk to Prof. Ramlau face to face.